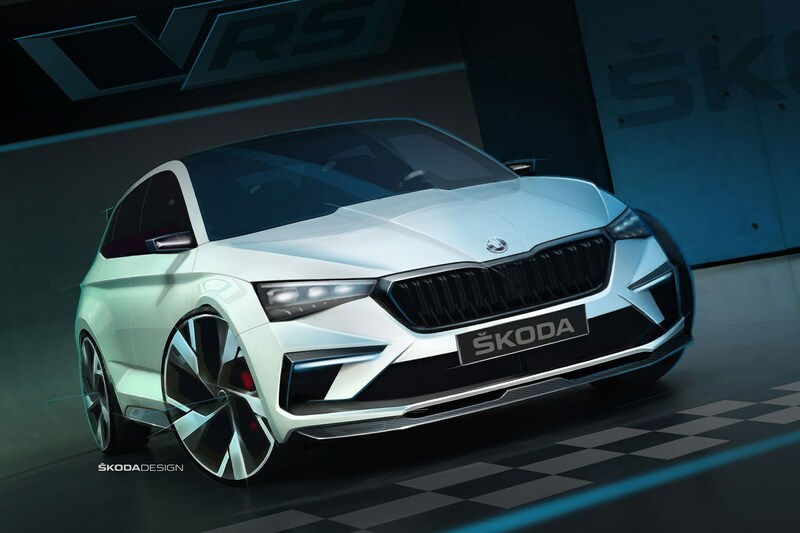 The Skoda Vision RS concept car is a dead giveaway as to what will replace the Rapid in spring 2019. Although purportedly a show car, this in fact is the evidence that the hard-to-pigeonhole Rapid will give way to a more conventional Golf rival. The new production car will follow soon after; we're anticipating seeing it in autumn 2018, and it will wear a brand new name - neither Rapid nor another archive badge will be used, we hear. 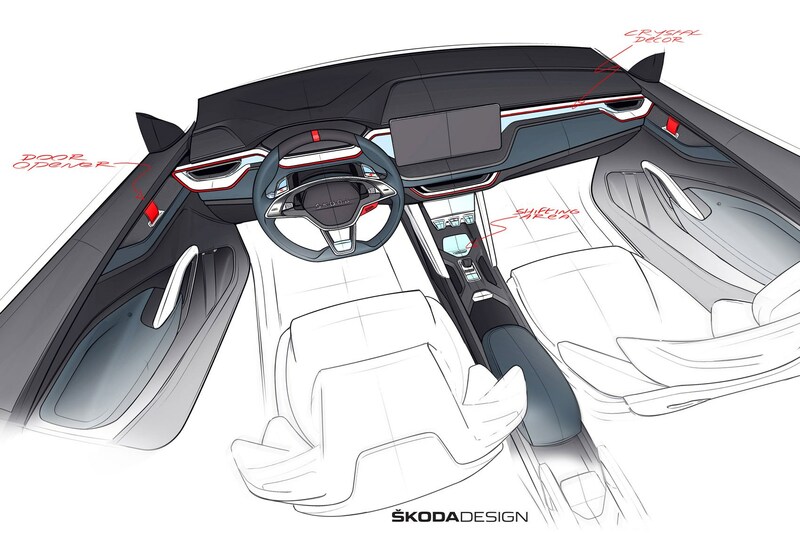 When Skoda told us it had built a vRS concept car with Ferrari F40-style fabric door pulls, a fully fleshed-out hybrid powertrain and vegan-friendly cabin materials we couldn’t wait to see what they had up their sleeve. 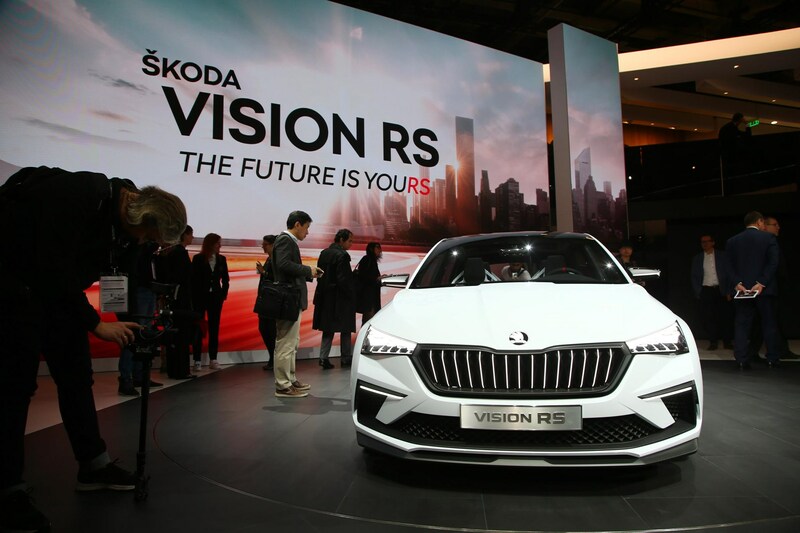 We’ve now seen the Vision RS twice - at a sneak preview event near Prague and now at the Paris show, too, and it’s no less striking than that rather concise description suggests. The show car is a plug-in hybrid. 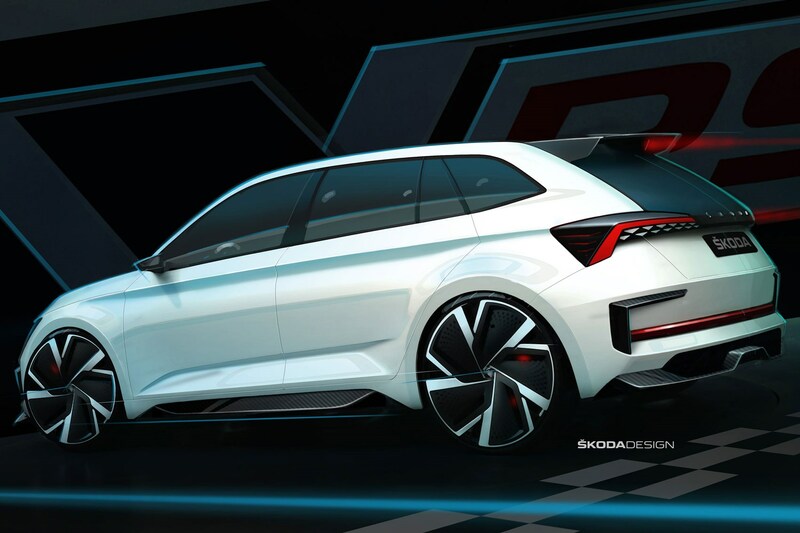 What’s really cool though is that quite a lot of this futuristic design is expected to find its way into production, as Skoda gears up to rolling out 10 new plug-in hybrid electric vehicle (PHEV) or battery electric vehicle (BEV) models before 2025. No firm answers on which vRS model will get hold of this drivetrain, or whether it’ll be sold alongside petrol and diesel versions, as is the current norm. It’s broadly similar to the current VW Golf GTE and Audi A3 e-tron – a 1.5-litre petrol engine and electric motor working together to produce 242bhp. Expect 0-62mph in 7.1 seconds, or driven more sensibly, about 40 miles of electric only range and CO2 emissions of 33g/km. The 13kWh lithium-ion battery can be charged in two and a half hours at a fast charger. 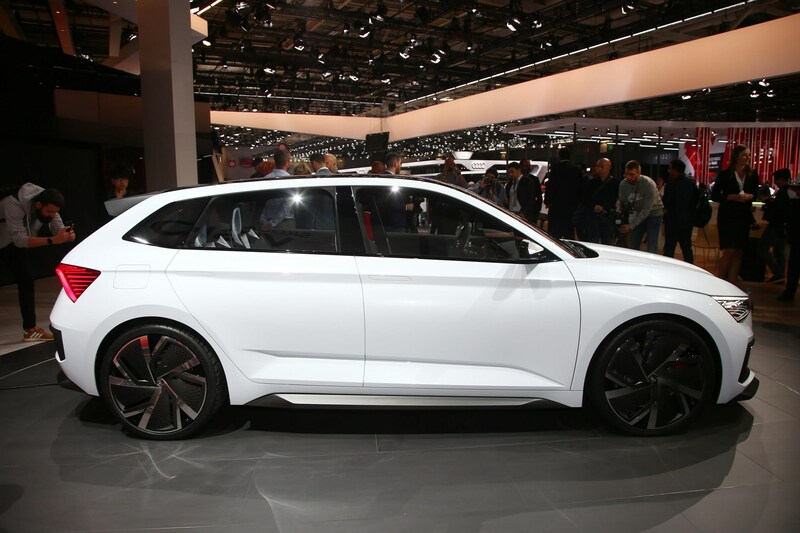 Why doesn’t Skoda make a PHEV already? 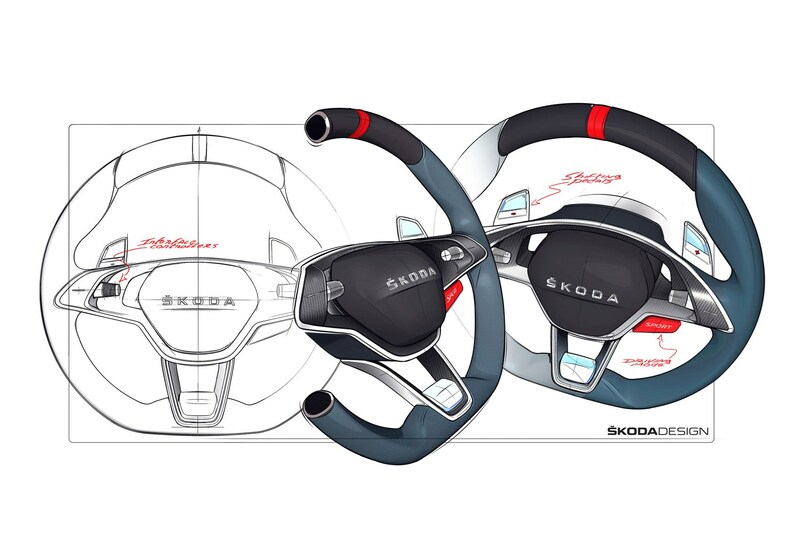 Bjorn Kroll, head of product marketing, said Skoda was waiting for the tech to mature, the cost to come down enough, and the opportunity to make a fun-to-drive model. He said: 'Whatever we do Skoda needs to stand for value for money. We want to be the best in the industry while keeping that promise of value for money – this is e-mobility for the masses, not exclusive customers. We know the Rapid will be replaced in spring 2019 and the rebrand should help distance the new car from what is far from the most desirable model Skoda makes. Sustainable materials make up the interior, including carbon textile made from 100% recycled polyester thread and Piñatex floor mats. That’s made of fibres from the leaves of a pineapple tree, in case you didn’t know. 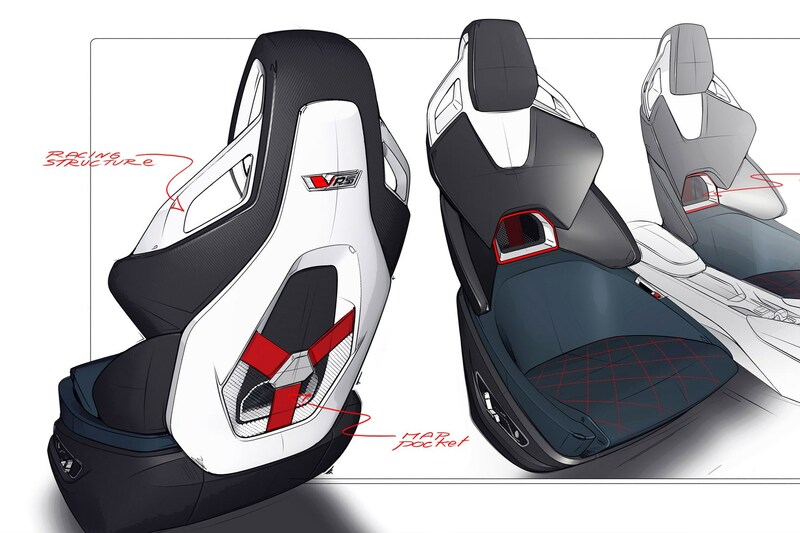 The concept has four individual bucket seats although production cars will have five, and sporty elements include fabric door pulls, Alcantara everywhere and a light up panel stretching the width of the dashboard, which changes colour depending on drive mode. A flat bottom wheel features rotary knobs to control the two 12-inch digital screens. A third on-demand screen for things like the climate control, folds away when you’re in sport mode and need to concentrate. This being a Skoda means while the transmission tunnel is a cabin-length carbon monocoque item, it’s full of storage pockets, and the boot measures 430 litres. What's the best bit of the concept car? 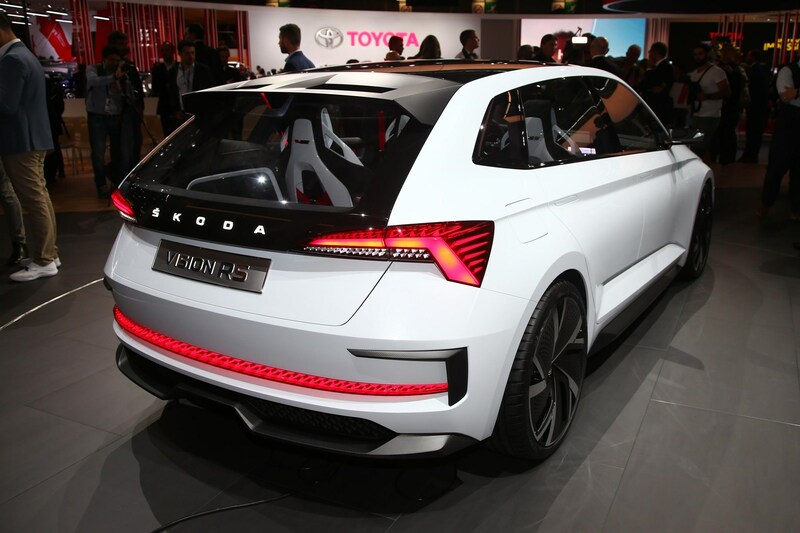 Most eye-catching of all the details are the light-up badge and grille, plus Skoda lettering on the bootlid. The latter features full-length glass like the current Rapid Spaceback, while the strong shoulder line connecting the head- and tail-lights looks just like a Superb’s.